Santa was in town on Friday. The real one. The BMIR (Big Man in Red). There are many impostors out there. You can call them "helpers" if you want to, but I think the fake Santa industry has gotten a bit out of hand. I mean, where is the quality control? Who screens these guys? Case in point: my six-year-old rushes up to me after sighting one of those "helpers" and says, "I know that's not really Santa. Santa doesn't have pimples." 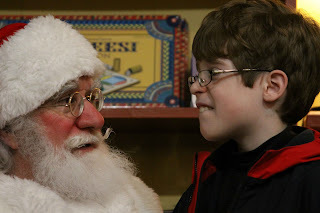 Could we please raise the hiring standards for our Santa impersonators? A Santa with pimples ain't helpin' anybody. But I digress. Anyway, the real BMIR was here. For two hours only. He comes every year to our favorite little toy store. And we get a private audience with him. Well, we do and all the rest of our little hamlet who know a good thing when they see it. 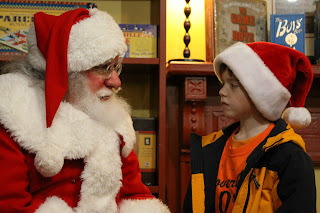 On these yearly visits, Santa takes as much time with each kid as is needed. You bring your own camera and take as many shots as you like. We talked to Santa about how he heats his sleigh (it a magic heater, in case you are wondering, and it only works on Christmas Eve). We now know what kind of cookie he likes best. I'm not going to share that with you, because then you all would be leaving out the same kind of cookie for him on Christmas Eve, hoping to butter him up a bit to get some extra presents under your tree and that wouldn't be right. Santa needs to have a variety of cookies throughout the evening. And he now knows he can get his favorite at one special house. That works out nicely, don't you think? But anyway, I almost forgot to mention my kids. They told Santa exactly what they want, but only one thing each. I couldn't believe that they only requested one gift. We are talking about nine- and six-year-old American boys. You know they want it all. But all they asked for was one. Maybe manners? Maybe a test? We'll see. But one of the items is on backorder for a very long time and Santa clearly knew this as he told my son that the Elves were severely backed up on production of said toy and he then gently tried to steer my one son in another direction. My son would have none of that re-direction and said politely, "Thank you for the other ideas, but I want the ?@*&." So Santa better be creative on Christmas Eve. I am sure he will. Went to Martha Stewart taping yesterday...loads of fun! Very authentic looking Santa ... I'm sure he'll come up with the real deal for your son! Hey Courtney! I just started a blog! hope you guys had a great Christmas! Had so much fun seeing u at Thanksgiving! !